The EDAN iM50 patient monitor is a latest generation monitor which offers the perfect solution for patient monitoring – even whilst on the move. Because the patient monitor is equipped with a built-in lithium-ion battery, is lightweight and has compact dimensions, it is ideal for portable use. 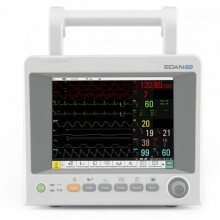 You can view up to 11 graphs on the 8.4" display at once.The EDAN iM50 patient monitor is available either with or without a built-in printer. Click the button below to add the EDAN iM50 with CO2 - Multi-Parameter Color Patient Monitor to your wish list.